The 2018 Issuetrak User Conference is almost upon us! We can’t wait to see you! Next week, Issuetrak will be hosting the 2018 User Conference. One of the features we’re most excited about is the inclusion of a customer panel discussion. The conference is for our customers, so what better way to have a pulse on what works and what doesn’t? You’ll be hearing directly from customers themselves! In case you haven’t heard, we’ve rescheduled the Issuetrak User Conference for October 10th and 11th. The good news for you is that we’ve also extended registration! As many of you know, Hurricane Florence is sitting off of our coastline with a lot of unknowns about final landfall and the impact to the Hampton Roads area. The Governor of Virginia has declared a state of emergency with a mandatory evacuation for Zone A residents in Norfolk and Virginia Beach that went into effect at 8 a.m. yesterday, September 11th. 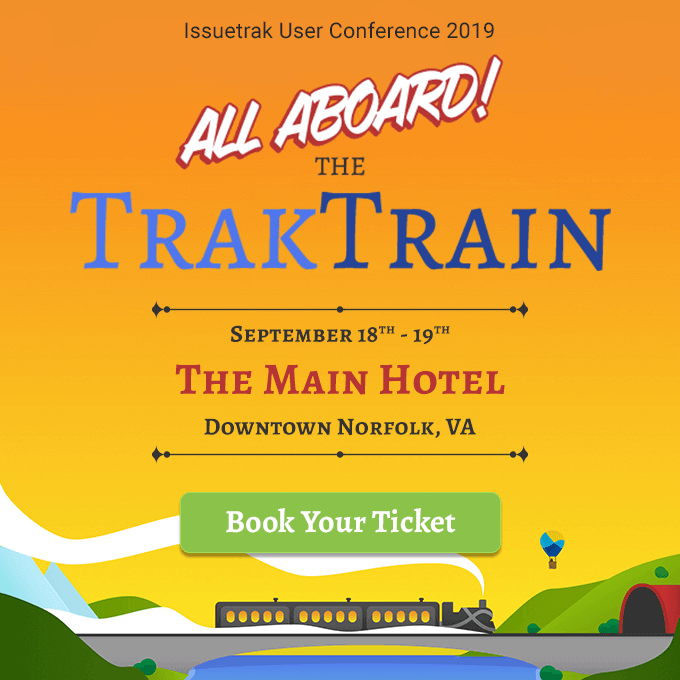 Registration is currently open for the 2018 Issuetrak User Conference to be held near Issuetrak headquarters in Norfolk VA at the Norfolk Waterside Marriott. Whether you are an Issuetrak veteran, just starting out, or still evaluating, you have something to gain by attending the conference. As always, the number one question is what can you get out of the conference? How can it benefit your users or customers? Issuetrak is a fast-paced, agile software company based in the Hampton Roads area of Virginia. We’ve got a 20-year track record of successfully developing issue-tracking and process management software for companies of all sizes. We’re stoked on innovation and we love data, and we’re harnessing the power of both to develop a next generation product. We are a customer-centric company with a dedicated vision of creating the most robust and versatile software solution for our clients. And, we aren’t afraid to take risks to make this happen.